It’s okay to be angry in a crowd; the crowd feeds on your anger, digests it, nourishes your rage as your rage nourishes it. All of a sudden you feel powerful. You can take on anybody. It is not their city anymore, it is your city. You own this city by right of your anger. There’s tragedy in the insane. And not only in what’s defined as insanity in this historical era. There’s another tragedy, that of not being listened to. Whenever someone diagnosed with mental illness commits a crime, the pathology is used to annul all questions and wipe out any discourse on meaning. The person is no longer a person with a history and circumstances, in which the illness is a circumstance and part of the story, never the whole picture. The person is no longer a person, but an illness. 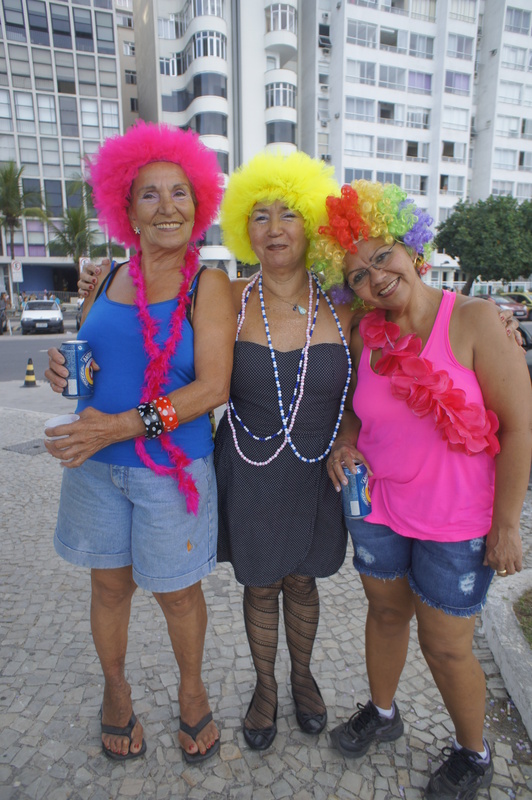 Carnival is Rio de Janeiro’s main event. We see this movement taking place at this time as blackmail. Given the turbulence that began last June and continues to this day, it seemed that this Carnival would somehow be different. But in what way, if Carnival is already about turning things upside down? Who could have guessed that the newly-formed RioRealblogTV team would hit the nail on the head, weeks ago, when we chose the subject matter of our first video (click on the captions icon to see English subtitles)? The irony couldn’t be bigger. While Carnival stands for a retreat from all that is authentic, with revelers masquerading as sailors, pirates and nuns, reality shoved its stinky face into our own. This year, Rio’s 15,000 garbage men awarded long life to the mountains of detritus that they used to remove from our sight, almost magically. So here is the violence we feared this year. Inviting the mayor to pick up a broom and sweep the city clean by himself, garbage workers marched city streets in protest. 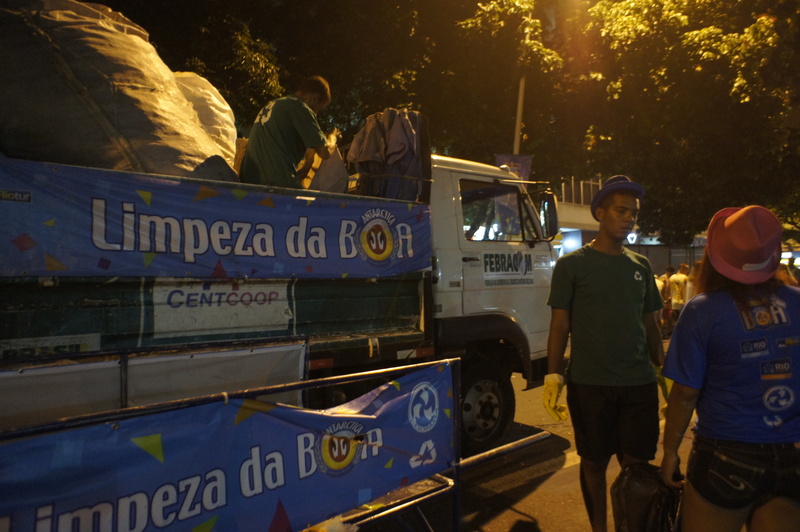 “The mayor wants to hold the World Cup and the garbage workers want to buy groceries” one sign said. The mess presents us with the complexity of the moment, with strikers (now fired) claiming that the union, that negotiated a 9% pay rise, doesn’t represent them. How should we calculate the value of urban sanitation now, when a garbage man or woman can easily find another job, the cost of living is rising frenetically, and we’re on the eve of the World Cup? Last year, the blog commented on the (lack of) sustainability of Carnival seen in the quantity of trash it produces. It seems that City Hall, Dream Factory (the company that organizes street Carnival) and the soft-drink and beer manufacturer, Ambev, also identified the problem. This year we saw an effort on their part to collect recyclables and orient street vendors. But the Carnival 2014 strike brings up a kind of carelessness that goes beyond the environment, that permeates all of Brazilian society and may well be a key source of the violence we’ve been experiencing, as Eliane Brum notes in her excellent article. Carelessness of the human being. Why is Rio so dirty? 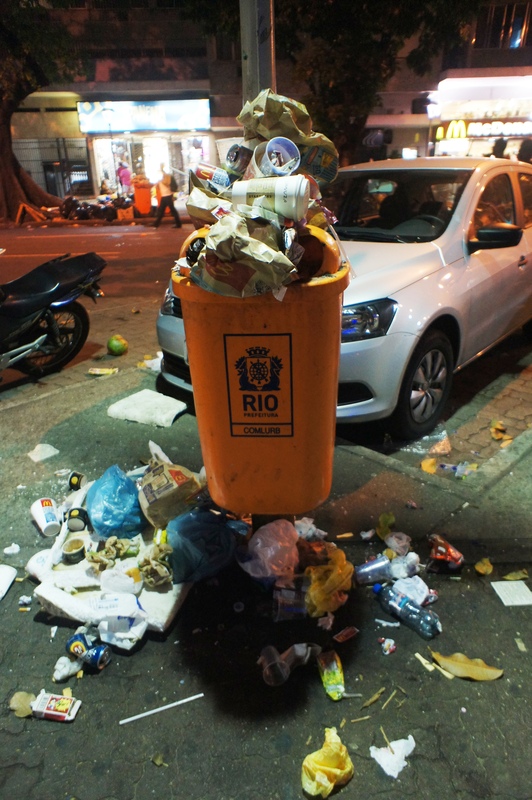 This entry was posted in Brazil, Transformation of Rio de Janeiro / Transformação do Rio de Janeiro and tagged Carnival 2014, Carnival 2014 Rio de Janeiro, Garbage strike Rio de Janeiro, RioRealblogTV, trash Rio de Janeiro. Bookmark the permalink. The promoters of the Copo want to present to the world an image of Brazil that does not correspond to the lived reality of a very large portion of the population. Who knows what their reasons are for choosing to spend so many billions of reais on soccer stadiums rather than public services. They say it will help Brazil’s economy, but that doesn’t seem to have been the case in recent history for nations that have hosted the Copo and the Olympics, unless by economy they mean the well-connected enterprises that will profit directly from these events. Will these profits ever trickle down to the benefit of the public at large? HIstory suggests they will not. As the Copo approaches – with the Olympics soon to follow – and public opinion polls show that far fewer Brazilians are enthusiastic supporters of the Copo than when the idea was first suggested – the powers that be appear to be panicking. They try to pass legislation which will criminalize legitimate protestors as “terrorists,” taking a page out of the playbook now being followed in the United States as powerful interests try to protect their ever increasing share of the nation’s wealth from the ever increasing numbers of the poor, disenfranchised and disillusioned. The attempt to suppress dissent indicates they will do whatever they think they need to do to preserve the image they are trying to promote, rather than do what needs to be done to address the reality that contradicts the image. They will repress those who disagree and thereby contradict the image. If this trajectory is followed, the Copo and the Olympics will resemble Sochi in terms of the number of military deployed to preserve order and the illusion of order. The only question is whether the repressive tactics will be “successful,” in that they temporarily quell protests, or whether they will stimulate larger protests and more perilous confrontations with the assembled legions of police. Eliane Brum’s excellent piece seeking the meaning behind these “disconnected” incidents of violence in Brazilian society goes to the heart of the matter. Pretending that these incidents do not represent a deeper truth about Brazil won’t make the problems go away. Rather, the most likely result of ignoring the deeper truth will only be more incidents. Likewise, Brazil will not become a more just, equal, stable and happy society just by pretending that it already is one, for the benefit of an international futebol audience. Thanks so much for this, Jeff. I like to put the Copa in perspective, think about it given history and what will come after. Maybe it’s because I barely understand soccer? At any rate, it’s important not to lose sight of the enormous social change that’s been afoot here for a decade and will surely drive future events, sporting or otherwise.